The Hellhound is an upgraded approach to a familiar classic. The design features a single cutaway body, with a 25.5" scale length and hardtail bridge. It's a highly customisable and versatile instrument suited to any genre of music. If your jam is blues, country, rock or facemelting shred, the Hellhound can give you the tone you're after. 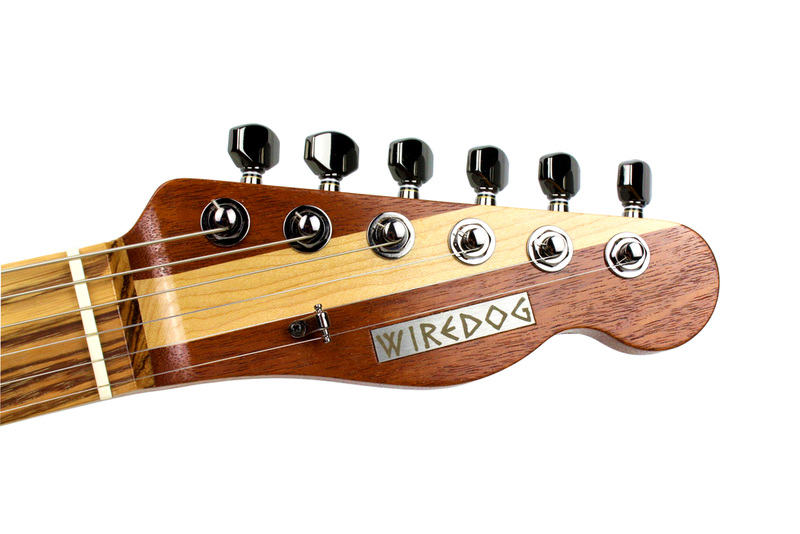 The Wiredog Hellhound can be tailored to your own personal specification including woods and construction, pickup type/ configuration and hardware. Body and neck construction can be one-piece, or multi-laminate; figured tops can also be added. Construction can be both bolt on or set neck with a profiled heel. Pickup configuration can be tailored to your request. I typically use British pickups, including Bare Knuckles, Creamery and Mojo. However, if you have something else in mind, this can be included where possible. Typically our models use Gotoh hardware, including staggered locking tuners, and a hardtail bridge, but other hardware can be sourced as per your specification. I only use environmentally friendly finishes, including plant-based oils, and water-based paints and lacquers (satin and gloss). Pricing starts at £1,599 and includes a Gator hardcase, and free U.K. mainland delivery. A customised quote will be provided on request.